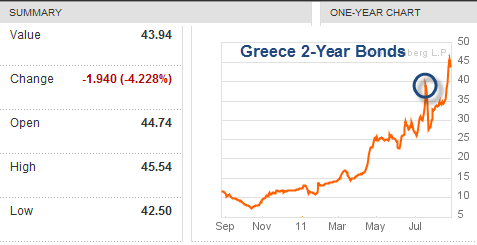 Greece To Default: Interest Rate On 1-Year Greek Government Debt At Whopping 60 Percent!!! And all taxpayer bailout money went to the banksters for NOTHING in return (except more destruction and chaos. Exactly as planned by the elitists.). “Greece failed long ago. It is only stubborn idiots at the ECB, EU, IMF, and leaders of various countries who insist otherwise. As intended by the elitists. Don’t wait for the dollar and the euro to collapse on you. Once again the bond markets have spoken, and once again the message is the same: default. Greek two-year bonds are near 44%, having touched as high as 46%. The interest rate on 1-year Greek government debt is a stunning 59.8%. 44% a year, for two years or whopping 60% for one year, unless of course there is a default. Not only does the bond market say Greece will default, but the implied haircuts are huge given those interest rates. 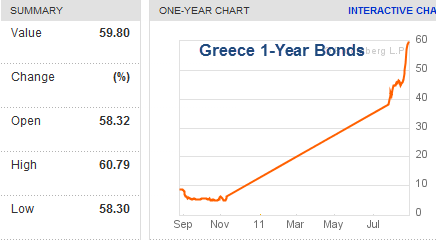 Supposedly “Greece was Saved” on that blue circle when yet another bailout (throwing more good money after bad) was approved. The deal unraveled for numerous reasons but demands by Finland for collateral are at or near the top of the list. Austria, Slovakia, and the Netherlands now want collateral as well. Under great pressure from Germany, the EU, and IMF, Finland allegedly dropped those demands. It was a lie. Finland did not drop demands for collateral, and that shows you the effect of multiple veto points where such decisions must be unanimous or they fall apart. Finland is just one of 17 euro zone countries whose parliamentary approval is needed for the expanded bailout fund and whose domestic politics could upset the process. The case of Finland points to a bigger governance problem in Europe, said James Savage, a professor at the University of Virginia who has published a book on European monetary union. Officials from European Finance Ministries spent much of Friday in long- distance negotiations about the collateral issue but did not reach an agreement. Conflicting reports about the negotiations have fed market confusion. The news media in Germany and other countries reported Friday that Finland had dropped its demands, but the reports were swiftly denied by Finnish officials. The climate created by the collateral dispute could make it more difficult for the European Central Bank to continue to defend Italy and Spain in bond markets and contain their borrowing costs. This month the E.C.B. has spent €36 billion, or $52 billion, intervening in debt markets in an effort, so far successful, to cap bond yields for the two countries. The E.C.B.’s task could prove more difficult when trading volume picks up, especially since both Spain and Italy are scheduled to try to sell debt this week. “A litmus test for the effectiveness of the E.C.B.’s bond-buying program is in the cards,” Rainer Guntermann, an analyst at Commerzbank, wrote in a note. The collateral dispute is not the only threat to the bailout package. The plan that leaders worked out in July also calls for banks and other investors to swap some of their existing holdings for new bonds that would be worth less but carry guarantees. The plan is designed to cut Greek debt by €37 billion. But on Friday, in what was probably a tactical move to put pressure on bond holders to accept the deal, Greece said it would back out of the debt relief plan unless 90 percent of investors agreed, Reuters reported. Nobel prize winner Aumann says “Greece should be allowed to fail”. Greece failed long ago. It is only stubborn idiots at the ECB, EU, IMF, and leaders of various countries who insist otherwise. They insist otherwise to protect their banks. Yet, by throwing more money into the pot that will now clearly be defaulted on, they have made matters far worse. Now that Finland wants collateral for Greek loans, it will do the same if Spain or Portugal needs more loans. Moreover, I keep wondering when the citizens of Spain, Portugal, and Ireland have had enough, given the success of Iceland in telling the ECB, EU and IMF to go to hell. Iceland is recovering. The PIIGS are not. How much more Italian bonds can the ECB buy before it runs out of cash, willpower, or completely drains the EFSF €440bn pool of money? While pondering the above question please note that German President, Christian Wulff, leader of the Christian Democratic Union, says that ECB bond purchases are “legally and politically questionable”. In a cannon shot across Europe’s bows, he warned that Germany is reaching bailout exhaustion and cannot allow its own democracy to be undermined by EU mayhem. “I regard the huge buy-up of bonds of individual states by the ECB as legally and politically questionable. Article 123 of the Treaty on the EU’s workings prohibits the ECB from directly purchasing debt instruments, in order to safeguard the central bank’s independence,” he said. Mr Wulff said the ECB had gone “way beyond the bounds of their mandate” by purchasing €110bn (£96.6bn) of bonds, echoing widespread concerns in Germany that ECB intervention in the Italian and Spanish bond markets this month mark a dangerous escalation. The blistering attack follows equally harsh words by the Bundesbank in its monthly report. The bank slammed the ECB’s bond purchases and also warned that the EU’s broader bail-out machinery violates EU treaties and lacks “democratic legitimacy”. The combined attacks come just two weeks before the German constitutional court rules on the legality of the various bailout policies. The verdict is expected on September 7. The tone of language from two of Germany’s most respected institutions suggests that both markets and Europe’s political establishment have been complacent in assuming that the court would rubberstamp the EU summit deals in Brussels. Mr Wulff rebuked Chancelor Merkel, saying political leaders should not break their holidays every time there is trouble in the markets. “They have to stop reacting frantically to every fall on the stock markets. They mustn’t allow themselves to be led around the nose by banks, rating agencies or the erratic media,” he said. Kiss a larger EFSF goodbye unless 17 nations all agree to raise the pool to a collective to the proposed €2.2 trillion from the current €440 billion pool. In other words, kiss a larger EFSF goodbye, expect a test of the ECB’s Italian, Spanish, and Portuguese bond purchasing power, and expect a German court test that in-and-of-itself would settle this matter once and for all. Even if the German courts approve the deal, there are still more than 17 points of failure, counting investors. One way or another Greece will default. The sooner the better, actually.